The Reading, Pa. Buccaneers (97.913) captured the Drum Corps Associates (DCA) World Championship Open Class title on Sunday, Aug. 31 in Rochester, N.Y., wrapping up a weekend-long series of all-age corps events. This is the fourth-straight championship title the east coast corps has earned, maintaining an undefeated competitive streak that spans four seasons. Taking second place with the group's highest score ever was Minnesota Brass, Inc. (96.513) of St. Paul, followed in third by the Empire Statesmen (95.063) of Rochester. Also on Sunday, the Atlanta based Alliance took the Class A title. View all scores at DCACorps.org. Check out these news posts recapping the DCA World Championships: Drum corps compete in Rochester for world champ title (Democrat and Chronicle, Rochester) Bravo! Brass! (KARE 11, Minneapolis/St. 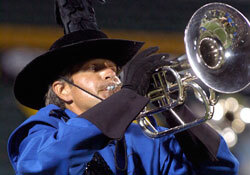 Paul) Photo courtesy Drum Corps Associates.